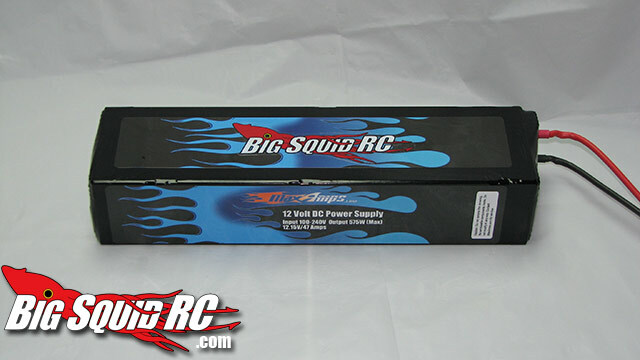 Max Amps 12v Power Supply Review « Big Squid RC – RC Car and Truck News, Reviews, Videos, and More! 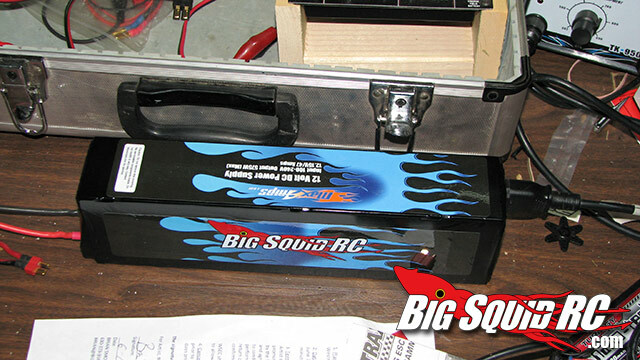 As battery quality and sizes get bigger and better, chargers come out to feed the batteries. At the beginning of that food chain though is the power supply. 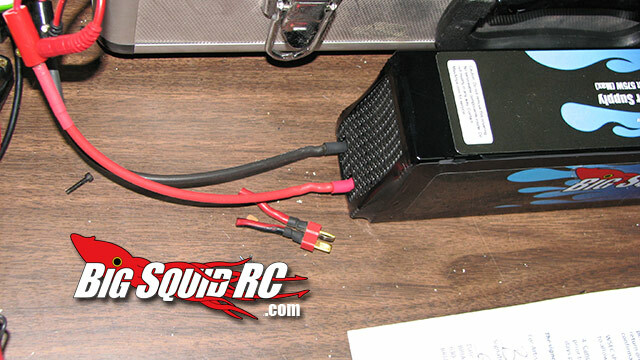 Thew new MaxAmps 12V Power Supply was designed to feed those chargers, which in turn charger the batteries. Is the new MaxAmps 12volt capable of meeting our needs? Keep reading to find out..
Primary Competition: There are a ton of power supplies out there, but not many of them can do 47Amps. What’s In The Box: The Power Supply with bullet connectors already installed, and a power cord. Build Quality: The quality out of the box was good. There were no issues, we were able to plug it in and go. 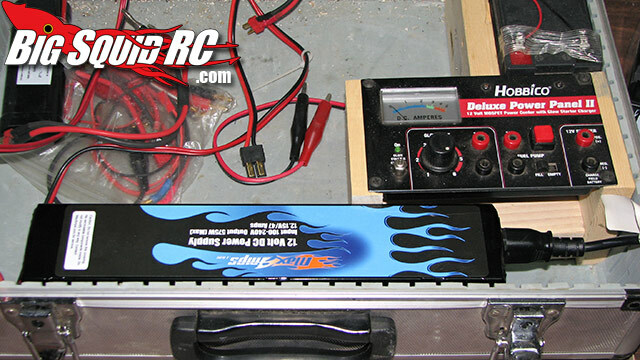 Test Venues: Our on-the go charger box, and our work bench. 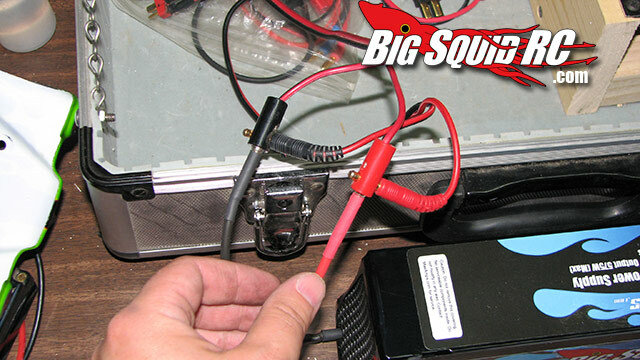 Recently, the main power supply we have been using for our on the go charger box has been having trouble keeping up. As you can guess, we go through a LOT of batteries around here. From all of our charger and battery shootouts, to just our daily use, the power supplies we have around the office get used a TON. The slim case of the MaxAmps power supply allowed us to still use it in our portable charger case. It was a perfect fit. The fact that the air runs through the supply long ways was ideal, and I didn’t need to worry about blocking vents on the sides. 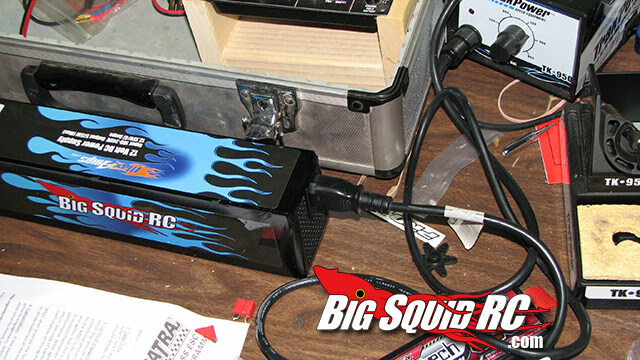 With our old power supply, we had to worry about charging 2 or more 4S lipo’s at the same time because the strain our chargers would put on the old power supply was causing it to overheat once in a while. The MaxAmps supply does not even break a sweat when we charge 2 4S packs. Because it can handle up to 47 amps, we could actually throw another couple of chargers and batteries on there. The internal fan works well to keep the power supply cool though it is a little loud. If you were going to be using this in a quit area, the noise could be an issue, but since we were using it in the work shop, where it’s always noisy from someone working on something, it wasn’t a problem. The power supply performed well under all sorts of conditions, including a few days when the air conditioning wasn’t on in the shop, and it was easily 95+ degree’s in there. We were still able to run and charge batteries all day without trouble. The price of $80 is actually pretty good. There are a lot of other power supplies out there, and most of them are $60 to $150, and most of them could not touch the power output of the MaxAmps. In the end, we have found a perfect replacement and upgrade to our old setup. Workability – 9.0/10 – This thing is a work horse! It handled everything we needed to power, no problem! Car Show Rating – 8.5/10 – It looks decent, and just happens to be the perfect fit for our already assembled box. Noise could be a factor to some people. Value- 9/10 – For $80, you would have trouble finding a power supply of this quality that can put out this amount of power. Big Squid Rating – 8.8/10 – Tentacles.. 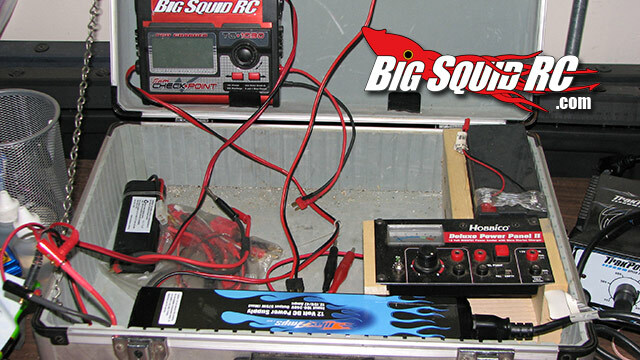 Overall it was a great fit for our charger box, and can handle all of our power needs. Want to see how we built the portable charger box? Check out our article we wrote in the Hobby Town Hobby Outlook magazine.